Buy Natures Aid SleepEezy ® 150mg Valerian - 60 tablets in the UK from our online shop or directly from our independent Scottish store. Adults and the elderly, take 1-2 tablets half an hour before bedtime. If necessary, an additional tablet can be taken earlier in the evening. Take continuously for 2-4 weeks. As official Natures Aid stockist, we sell genuine Sleep & Relaxation directly from our shop in Scotland and online throughout the UK. Where can you buy real SleepEezy ® Valerian safely online? If you are wondering where you can buy Natures Aid SleepEezy ® 150mg Valerian - 60 tablets safely online in the UK, then shop with us. We are an actual health foods shop; with real people selling real foods and products. Our award-winning independent shop is located in Stirling, Scotland since 1976. You can buy our Natures Aid nutritional supplements and other genuine Sleep & Relaxation in store or safely place an order with us online or over the phone. 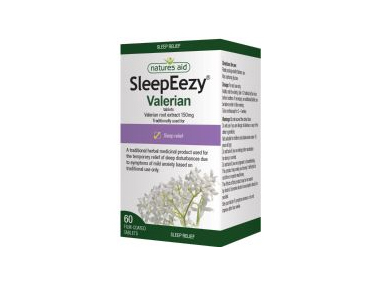 SleepEezy ® Valerian - Natures Aid SleepEezy ® 150mg Valerian - 60 tablets in Sleep & Relaxation and Herbal Remedies, Tinctures & Supplements.